FILE - Pigs roam in a feedlot on a farm in Clear Lake, Iowa. Mexico could revive the list of mostly agricultural products it used to push Washington into letting Mexican truckers on U.S. highways in 2011; pork products topped that list. Farmers in the U.S. agricultural heartland who helped elect Donald Trump are now pushing his administration to avoid a trade dispute with Mexico, fearing retaliatory tariffs that could hit over $3 billion in U.S. exports. The value of exports at risk is based on a Reuters analysis of a tariff list that Mexico used in a trucking dispute six years ago and that Mexican officials have said could serve as a model if Trump sets new barriers to Mexican goods. Pork producers contacted Trump's transition team soon after the November 8 election to stress that tariff-free access to Mexico has made it their top export market by volume, said John Weber, president of the National Pork Producers Council. The council has sent the administration multiple letters, including one signed in January by 133 agricultural organizations, and is arranging for several hog farmers to fly to Washington next month to talk to officials. "We just keep pounding them on how critical trade is to us," said Weber, who fears Mexico could revive the list of mostly agricultural products it successfully used to push Washington into letting Mexican truckers on U.S. highways in 2011. Pork products topped that list and, if revived, the tariffs would apply to over $800 million worth of annual pork exports, according to data compiled by IHS Markit's Global Trade Atlas. "We'll be the first to take the hit," Weber said. The lobbying effort by U.S. businesses that rely on the Mexican market shows how Mexico can press its case in Washington despite having an economy 1/17 the size of America's and relying on the U.S. market for nearly 80 percent if its exports. In Iowa, where pigs outnumber people 7 to 1, hog and grain farmer Jamie Schmidt voted for Trump in part on his promise to cut regulatory burdens for businesses. 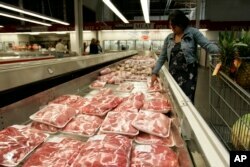 FILE - A shopper looks over pork products at a Costco store in Mountain View, Calif.
Now he and others who farm the flat, rich land around Garner, Iowa, worry about trade. Schmidt gets about half of his income from hogs, earning $4 to 5 for each of the 425 pigs he sells per week, usually to a Tyson Foods packing plant in nearby Perry, Iowa. Tariffs from Mexico could depress U.S. wholesale prices and wipe out his profits, Schmidt said. "It would be devastating." In December, after fears of a trade dispute fueled a deep peso slump, Mexico started mapping out U.S. states that are most reliant on its market, replicating the strategy it used in the trucking dispute, said two senior Mexican officials. Mexican officials also prepared briefs, seen by Reuters, on Mexico's own risks in a dispute, including losing much of its cost advantage in building cars, such as the Ford Fusion made in Hermosillo, Mexico. Reuters could not verify a complete list of products and states Mexico considered targeting this time around. But the country's foreign minister said last month that tariffs could target Iowa, which raises a third of U.S. hogs and exports about a quarter of its pork production, $100 million of which went to Mexico last year. The minister also said tariffs could aim at Wisconsin, the center of U.S. cheese production, and has singled out Texas for its "notable" trade surplus with Mexico. All three states voted for Trump in the 2016 election, with the president taking Iowa and Wisconsin by slim margins. FILE - Ford Fusions are for sale on the lot at Butler County Ford in Butler, Pa., in November 2015. 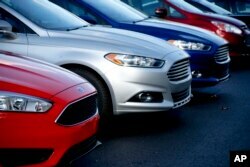 Ford Motor Co. has built the midsize Fusion sedan at its plant in Hermosillo, Mexico, since its introduction in 2005. Trump has accused Mexico of destroying U.S. jobs and has vowed to leave the 1994 North American Free Trade Agreement with Canada and Mexico if he cannot renegotiate better terms with Mexico. The United States went from running a small trade surplus with Mexico in the early 1990s to a $63 billion deficit in 2016. Besides pork, cheese was also a top target in the trucking dispute in which Mexico retaliated with tariffs against rules that banned its trucks from U.S. roads. Some $200 million in current annual exports of cheese would be targeted if the tariff list were revived, according to the IHS database, which the U.S. government uses to measure the impact of trade disputes. The full tariff list would apply to $3.25 billion in current U.S. exports. John Holevoet, the director of government affairs at Wisconsin's Dairy Business Association, said he has attended multiple meetings with Wisconsin federal lawmakers this year where risks of Mexican trade were discussed. Weber of the pork producers group said he believed the Trump administration understands the vulnerability of U.S. farm exports. Republican Representative Steve King, who represents Iowa's agriculture-focused 4th Congressional District, also pointed out that Iowa's role as the first state in the presidential nominating process helps keep farm interests in Washington's view. But King told Reuters he was worried the White House was still not taking trade risks seriously enough. A possible 20 percent tax on Mexican imports, which White House spokesman Sean Spicer has said could also pay for Trump's proposed border wall, would cause a trade war, he said. King said he had been in contact with the White House on the matter but had yet to secure a one-on-one meeting with the president. "I'm making sure that here in Washington they know what this means."